Fast rising Urban Gospel artiste Justice Morrison says churches of today do not support young talents to grow. Speaking in an exclusive interview with ModernGhana Entertainment, Justice mentioned that, there are a lot of great talents in the church but because they don’t get the support they need to promote themselves, they end up turning to circular music. According to him, in the circular world there are lots of opportunities and people who are willing to help out. “There are lots of talents in the church who are neglected because of that they are forced to accept any offer which contradicts the principles of the church. You can be singing in a church for about 10-15 years and still get a handful of people when you organise a program,” he noted. 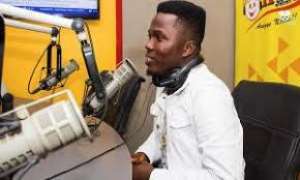 He cited Kuami Eugene as an example adding that, Kuami Eugene started off as a Gospel artiste in his church but because he didn’t get the support he needed, he became a circular musician which has earned him fame and lots of money. “If the church should throw their weight behind most of the young talents in the church and encourage them, it will promote lots of young talented gospel artiste who will use their talents to win souls for Christ, " Morrison intimated. He added that most of the companies in Ghana use circular musicians to promote their products and services and most of these brands seldom use gospel artistes. He urges Kalyppo, Vitamilk producers and others to use gospel artistes to promote their products. Justice Morrison recently released his new single titled “Testimony”. He is also working on producing more tracks this year.